While the names Betty Friedan and Gloria Steinem have become synonymous with second-wave feminism, the role of Jewish women in earlier feminist causes has gone largely unrecognized. 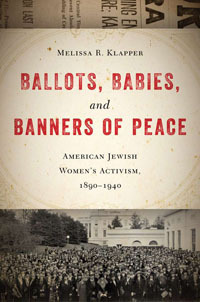 With her new book, Ballots, Babies, and Banners of Peace: American Jewish Women’s Activism, 1890-1940, Melissa R. Klapper, a history professor at Rowan University in New Jersey, is trying to change that, bringing to light the outsize role Jewish women played in the suffrage, birth control and peace movements. Moment spoke with Klapper about her work. Below is an edited transcript. Jewish women fell on both sides of the suffrage debate in the late 19th and early 20th centuries. What were some of the arguments for and against a woman’s right to vote? The argument against suffrage was that this was a complete break from tradition—women never had a political voice before, so why do they need one now? There was also a sense that politics was a very dirty business and that women should not have any connection to anything as corrupt as politics. An argument for suffrage was that if women got into politics, they could clean it up. There was a widespread assumption that politics was a corrupt business, but they had different ideas of what the effect of women having the vote would be. There was also the argument that women didn’t need the vote because their husbands or sons represented them, or that they could get everything they wanted anyway without the vote. One example of this was higher education. Women’s colleges, such as Barnard and Radcliffe, gave women access to higher education before they had the right to vote, so there was a sense that they didn’t need it to get what they wanted. But the bottom line was that legislatures voted on higher education funding and politicians voted on whether married women should have individual property rights. What were some of the birth control laws that existed in the late 19th century, and what was the role of Jewish women in overturning them? Birth control as a concept was of course not new—people had been trying to use birth control since ancient times. But two things changed in the mid- and late-19th century. One was the invention of vulcanized rubber, which helped improve condoms so that they were pretty efficient, if used correctly. The other was the diaphragm, invented in the 1880s, which also used a kind of rubber. Diaphragms were behind the birth control movement as we know it, because it meant that women could be in control. Birth control technology had been a dormant issue that no one paid attention to, but once people had better access to contraception, that aroused the ire of lots of people. In 1873 a series of laws called the Comstock laws were passed that classified disseminating or even discussing contraceptive information as obscene—and illegal. Before 1873, if you had a new method of birth control that you wanted to write to your sister in Kansas about, it wasn’t a problem. After 1873, writing that letter became a federal crime. The birth control movement was about spreading the use of diaphragms to women through clinics and overturning the Comstock laws, with the argument that it wasn’t obscene, it was just what families wanted to do to reduce the number of children they had. Jewish women were very involved at every level of the birth control movement. They were activists petitioning legislatures, going to Congressional hearings, standing on the courthouse steps and trying to get these laws overturned. They were consumers. Jewish women, more than any other group, adopted birth control very quickly. They were also doctors. A disproportionate number of the first doctors at birth control clinics across the country were Jewish women. Jewish women were everywhere. And organizations for Jewish women, which weren’t primarily about birth control, still supported it, and sometimes funded and ran birth control clinics. The majority of women in the birth control movement were mothers, not people choosing to have no children. There are wonderful pictures of Jewish women lined up for blocks with their baby carriages to go to birth control clinics, not to have no children, but to have fewer children and to make decisions about when to have them. Did access to birth control benefit Jewish women in any specific way? It helped Jewish women in the same way it helped all women: It gave them choices about how many children to have, and when to have them. Prior to its widespread availability for working class and poor women through clinics, the major form of birth control was abortion. One of the strongest arguments that the birth control movement made was that if we have better birth control, we’d have fewer abortions. People today would be shocked by some of the immigrant literature in which people talk about their mothers having 13 abortions. The birth control movement helped immigrant and poor women, who had no access to regular medical care, try to take matters into their own hands. Having lots of children very close together led to economic problems for women—their social mobility was limited and they would have problems taking good care of the children they did have. Why do you group peace alongside suffrage and birth control? It’s not normally seen as a women’s issue. One hundred years ago, peace was very much seen as a women’s issue. Women were seen as mothers, and mothers were seen as naturally peaceful. In our post-second wave lives, we don’t like to think that all women are this, or all men are that, but that was very much how people thought 100 years ago. There was also an undercurrent of anger after World War I: Men screwed up the world, now women should be in charge. Jewish women were major initiators in the peace movement. Jewish women’s groups had peace committees even before World War I. They had study groups, went to international conferences and corresponded with each other across international lines. There was a tremendous amount of Jewish peace activism because there was an international Jewish community—they were already connected, and they didn’t want to fight each other. Jews had a particular interest in keeping the world from fighting, because that was never good for the Jews. How did anti-Semitism affect the activism Jewish women were doing at this time? Anti-Semitism was present in all the movements I write about. In the suffrage movement, some of the biggest leaders, like Alice Paul and Elizabeth Cady Stanton, were pretty blatantly anti-Semitic, so that gave some Jewish women’s organizations pause in signing up for a movement that didn’t welcome them. Jewish women were more likely to get involved as individuals instead of as a group. There was some concern that the birth control movement was interested in limiting the number of Jews that were born. That was often an argument that was leveled against Margaret Sanger, but there’s a problem with that—birth control is always voluntary. Nobody was forcing these women to use diaphragms. Protestant Christian literature often said, “How can you get involved in the movement, it’s dominated by Jews?” as one of the ways of trying to prevent people from getting involved in the birth control movement. Where it comes out the most obviously and tragically in the peace movement is in the lead up to World War II. Jewish women found that Hitler and Nazism presented a particular threat to Jews and Judaism, but peace activists they had been working with around the world categorically refused to acknowledge that there was something special about this. In some cases, the way they expressed themselves can only be described as anti-Semitic. For many Jewish women, this was a terrible moment. They felt betrayed. It was really depressing for these Jewish women to see that many of their colleagues didn’t care and were willing to overlook the Jewish problem. What does it say that the three issues you address—voting, birth control and peace—are still highly contested issues today, more than a century later? It shows that women’s issues are human issues, and women’s rights are human rights. These are big, important issues that don’t go away. They don’t have easy solutions and can’t be solved right away, so it’s multi-generational activism that is necessary. Women at the turn of the century saw that these were among the biggest issues of the modern era, and that’s why they became such big feminist issues. And that’s why we’re still fighting some of those fights. It’s important to see that there’s a legacy of Jewish women’s activism that goes back before the 1960s and 1970s. Jewish women have always been involved in the issues of their time, and they’ve been major players in helping shape the modern history of the United States and other parts of the world as well. This is history that’s not in regular history books—not even regular women’s history books. It’s important for individuals looking for a usable past to see that Jewish women have always been involved, and also to make the point that the modern world was shaped, in part by Jewish women’s activism. People today can see themselves as links in the chain. Jewishness leads to certain kinds of activism in powerful kinds of ways and there’s no reason that couldn’t be true today as well. Ballots, Babies, and Banners of Peace is among several new releases about the experience of Jewish women. Moment senior editor Eileen Lavine shares her thoughts on two more. Fanny von Arnstein: Daughter of the Enlightenment was published in 1962 in German, written by Hilde Spiel, an Austrian Jewish writer, and has now been issued in English for the first time. It is a biography of the daughter of the Jewish master of the royal mint in Berlin who married a financier to the Austro-Hungarian imperial court, the first unconverted Jew in Austria to be granted the title of baron. Speil describes in detail the period of the Enlightenment in the third quarter of the 18th century when Jews were able to become a part of Christian society. Fanny became a popular hostess attracting politicians, the nobility and the intelligentsia to her glamorous drawing room. However, only a small number of Jews enjoyed these privileges, and many converted, including Fanny’s grandchildren. Spiel shows how the climate worsened under Frederick the Great, as a new wave of anti-Semitism broke out in 1815. Miss Anne in Harlem: The White Women of the Black Renaissance by Carla Kaplan describes the small group of women who became patrons of the Harlem Renaissance but rarely received any recognition or acknowledgement. Their label of Miss Anne was often one of derision by blacks and whites. Kaplan concentrates on six activists, including two Jews: Annie Nathan Meyer and Fannie Hurst. Meyer, a mentor and financial supporter of Zora Neale Hurston, grew up in a wealthy New York family, was a founder of Barnard College (she was furious that she was not recognized as the founder, attributing this to anti-Semitism), and penned an unusual play, Black Souls, the story of a white southern woman’s desire for a black man, which became a cause célèbre in Harlem. Fannie Hurst, the daughter of assimilated Midwestern Jews, was the highest-paid writer in the United States in the 1920s, and worked closely with African American social organizations. She too took Hurston under her wing and adapted a story Hurston told her into what became a bestselling book and movie, Imitation of Life, which concentrated on racial passing. Kaplan details how Meyer and the other Miss Anne women were ostracized from their communities by helping blacks.